The Wallaby Junior Desktop Adjustable Sit and Stand Workstation transforms your static workstation into a sit stand desk with the addition of this simple-to-operate desktop workstation. 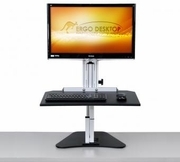 The freestanding computer station sits on your current desk to provide sit to stand height adjustment throughout your work day. Designed to hold your keyboard, mouse, and monitor all on one sturdy platform, this sit-stand workstation adjusts along a vertical track. The Wallaby Junior is designed to set your monitor to a desired height and keep locked in place. The monitor height will then move in unison with the work surface. The Wallaby Junior is not designed for mounting LAPTOPS, they can sit on the work surface though.